Individually Wrapped Peppermint Hard Candies. Made with Real Peppermint Oil. Brach's passion is making moments of your day just a little sweeter. Brach's has been America's Candy maker since 1904 - over 100 years, and their products are made with the finest, wholesome ingredients. Ingredients: Corn Syrup, Peppermint Oil, Sugar, Red 40. Allergy Information: This product was manufactured in a facility where milk, eggs, almonds, Brazil nuts, coconut, peanuts and soy are used in the production of other products. 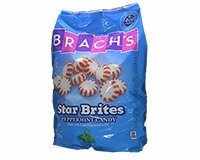 Brach's® is a Registered Trademark of Ferrara Candy Company, Oakbrook Terrace, IL 60181.